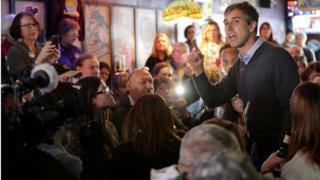 In his first day of campaigning as a presidential candidate, Texas Democrat Beto O’Rourke raised $6.1m (£4.6m), the largest of any 2020 candidate so far. The rising star’s online fundraising haul managed to beat Senator Bernie Sanders’ record of $5.9m last month in the first 24 hours of his campaign. Like other Democrats, Mr O’Rourke has refused to take any money from special interest lobby groups or corporations. The 46-year-old is one of 15 Democrats now in a bid for the White House. According to his campaign, he received donations from every state and territory, totalling $6,136,763. The campaign did not release how many donors contributed. This is not the first time his campaign has broken fundraising records. When he ran against Republican Ted Cruz for his Texas Senate seat, he broke Senate fundraising records by amassing more than $80m. While Mr O’Rourke ultimately lost his tight race against Mr Cruz, he demonstrated an ability to run a successful campaign and drew comparisons with former President Barack Obama. Speaking to reporters on Saturday, Mr O’Rourke said he had no “large-dollar fundraisers planned” and was ruling out “taking any PAC [Political Action Committee] money or any lobbyist money ever”. Mr O’Rourke’s fundraising figure comes on the heels of his three-day campaign tour road trip across Iowa, the state that will hold the first US presidential caucus. He will be campaigning in Michigan, Ohio and Pennsylvania this week. During his Senate race last year, Beto O’Rourke raised money like a presidential candidate. That was in a race against a Republican candidate, Ted Cruz, who was intensely disliked by the Democratic base, however. Now that the Texan is a presidential candidate, could he replicate his success when his competition is a diverse field of like-minded opponents? If the early results are any indication, the answer is a resounding yes. The Texan’s $6.1m mark in 24 hours put him ahead of even Bernie Sanders, whose small-donor fundraising prowess was thought to be unrivalled. It remains to be seen whether Mr O’Rourke’s pace can be sustained. What is certain, however, is that this eye-popping number will put a big target on the Texan’s back. Even if current polls don’t show him as a front-runner, his opponents are going to treat him as such. Other candidates are already taking veiled swipes at him, and their supporters and surrogates are pointing out his thin resume and sometimes chequered past. The 2020 Democratic field is a crowded one, with over a dozen lawmakers vying for the presidential nomination, including senators Elizabeth Warren, Bernie Sanders, Kamala Harris and Amy Klobuchar and governors John Hickenlooper and Jay Inslee. Mr O’Rourke and Mr Sanders have led the group thus far in terms of fundraising. Ms Harris raised $1.5m online in the first 24 hours of her campaign, while Ms Klobuchar reported $1m in the first two days. Mr Hickenlooper and Mr Inslee have also raised over $1m within days, US media reported. Candidates will officially report their fundraising totals for the first quarter to the Federal Election Commission on 15 April. If Beto O’Rourke’s campaign success continues, he may keep Donald Trump from being re-elected. But who else has a shot at becoming the next president? Find out who else is running and who might join them. Brandon Reynolds, 36, allegedly killed his daughter Friday. The police officer was shot on Sunday morning, according to a report. It is a portrait painted by artist Michael J. Deas based on a 1997 photograph. Runners will race through the North Korean capital in the annual event. The Blue and White party is running on a centrist platform against Netanyahu. Rep. Tim Ryan jumped into the crowded 2020 presidential contest on Thursday. Summerbell Brown, 10, was with her family when she was shot in the driveway. Copyright Planet Report 2004 - 2019 © All rights reserved.